One in four Australian children, in years 4 to 9, report being bullied every few weeks (Australian Covert Prevalence Bullying Study). Older children are more susceptible to cyber bullying. Children who are bullied may grow up with low self-esteem, and the effects of bullying can haunt them for the rest of their lives. For those of you who have had a difficult time growing up, you will know all too well the lingering effects of bullying. Luckily there has been more focus on it in the media. Various initiatives have been started to reduce bullying in schools. Parents and teachers are more aware of the early warning signs that a child may be bullied. How can dogs help bullied children? I think dogs might be an under-used resource in helping children who have been bullied. How can dogs help? Have a look at Dogs of Character, a marvelous initiative in Texas. Previously abused dogs, who have been rehabilitated, are brought in to school assemblies and spend time with children. The aim is to help children understand that you can survive traumatic experiences and have a beautiful life afterwards. For those children who are themselves the bullies, seeing an abused dog may lead them to reconsider their bullying. Caring for a dog may, in itself, be a healing experience for a bullied child. The child that feels unloved, unwanted and criticised, finds in his canine companion unconditional love and acceptance. The child learns to love and learns what it is to be loved. Another effect of dog ownership, if the child is adequately educated on responsible pet ownership, is that the child learns to treat animals with respect. I think this is the first step in becoming an empathic person, who is sensitive to the needs of others. A child psychologist in New Mexico published a paper in 2000, where he looked at the impact of dog ownership on 10-12 year olds. He found a significant difference in empathy and self-esteem between the adolescents who owned a dog and those who did not. Society is becoming increasingly narcissistic (just look at the abundance of reality TV shows). I love to imagine a future where every child understands that he is not the centre of the world and that great good can come from treating your fellow earthlings with respect. If you think your child may be bullied, visit Bullying No Way. Have you found any positive changes in your child as a result of dog ownership? Do you think dogs can help bullied children? What are your childhood memories of dogs? This is awesome! Great connection! Gorgeous image and great thoughts. 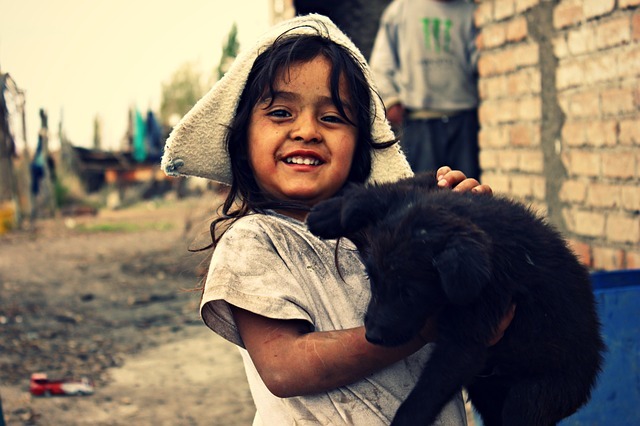 Dogs can have such a beautiful impact on children’s development – teaching them tenderness and unconditional love. Our wonderful little moodle, Monty, brings out such gentleness and love in our two boys (aged six and seven and a half), which is wholeheartedly reciprocated… along with lots of action, games and adventures!